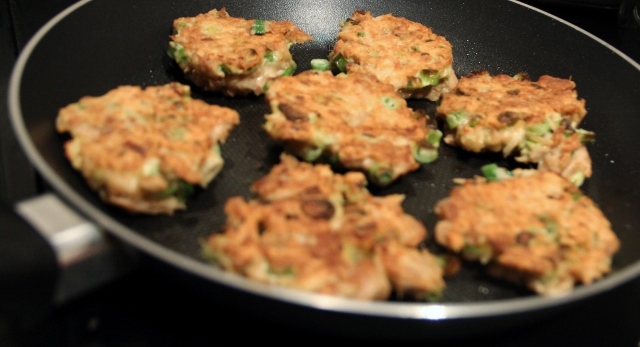 My grandmother used to make wonderful tuna patties, complete with left over mashed potato. We, however, never seem to have any leftover, but I love me some tuna patties. Fortunately, this recipe from Korean cooking site Maangchi doesn’t use mashed potatoes. As an added bonus, it’s quick to prepare, doesn’t require shaping or refrigeration time. Score! The original recipe called for 1/4 cup of onion, but some people have a giant spring onion plant in their kitchen that needs to be used up. Personally, I actually prefer it with the spring onions. 1. Heat a non-stick with 1-2 Tbsp of olive oil or butter. 2. Dump everything in a bowl and stir to combine. You may need more flour to make it all stick together, but remember these won’t need to be shaped, so will have more of a batter consistency. 3. Drop spoonfuls of the mixture in the heated pan and fry 3-4 minutes per side until done. You should get about six patties from the mixture. That sounds very good and very simple, perfect after a day at work. Yes, they are so quick and easy!